innovaphone conferencing is a nice sample solution to enhance the conference bridge available on the innovaphone gateways (so-called “BC Conference”). Users are announced with name when joining and leaving the conference room. The conference room can be labelled; before entering in the room the user will hear the name of the conference. Before entering in the room the names of the member’s already in are prompted. innovaphone conferencing stores all recorded names for further access; you have to record your name just one time. 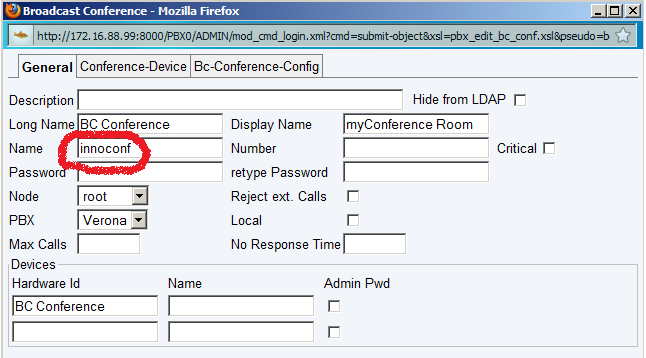 NB: for PBX from V11r1, this script is obsoleted by the built-in Conference object . innovaphone conferencing allows you to setup a very comfortable audio conference. If a number calls the innovaphone conferencing for the first time the system asks, after playing the welcome message, to record a name. The recording can be done immediately, just following the voice menu (“Please record your name, start recording with star and stop with any key”). After recording, the recorded name is played again. The record can be modify in any moment and anyway before entering in the conference room. If the same number calls the innovaphone conferencing system again, the system will not ask to record the name but welcome the caller, with the previously recorded name. So once recorded, innovaphone conferencing stores the names for the calling number. If the conference room is still empty, the system asks you to label the conference room. This is done via a voice menu invitation to record the name of the conference, even this recording can be modified later on. However if the conference room is already named, the caller is not invited automatically to label the room but the name of the conference if played. If you don’t like give a name to a conference room just press quickly “*#” when the recording of the name is requested (practically you record nothing and therefore the system will prompt “… in the conference, press star to join ….”). From this menu the caller can record again his name or label the conference room. The star-key allows the access to the conference room. If the conference unit is not reachable (configuration or network problems) or no conference channel is available (all available DSPs are used), a warning message is played. If the caller is the first member, he will hear “You are the first conference member”. If there are already members in the conference room, he will hear their names. After playing the list of the conference members, the caller access the conference room and all the members hear a warning ton (“beep”) followed by the name of the new entry. If a conference member exits from the conference room, the remaining members will hear a warning tone followed by the name of who has left. When the last user leaves the conference room, the room label will be automatically cleared. The remaining setup has to be done in the PBX. First configure a BC Conference object. Leave all items to their default settings, except the one specified. 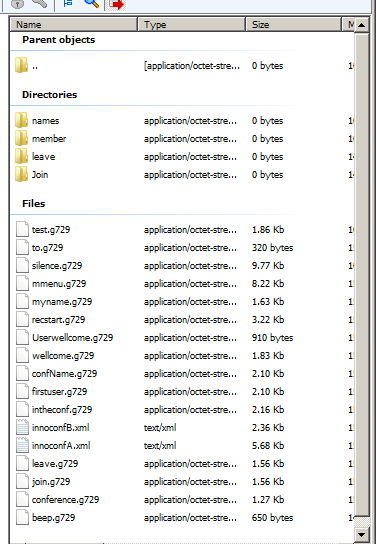 Basically the BC Conference object doesn’t need a number because the access to it will be trough a XML script and names. Therefore it is important that the Name of the BC conference object is “innoconf”, the Description and Long name are not important. 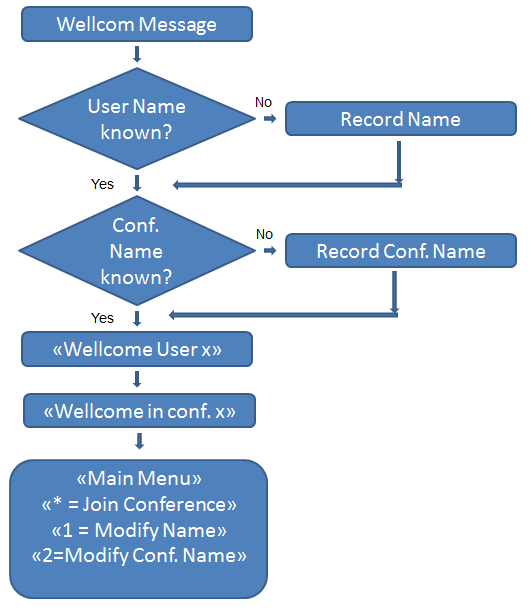 The Display Name should be nice, because if the user is in the conference room, he will see this name on the display (while he is in the menu “outside” the conference room, he will see the display name of the XML, so even from a display point of view the user knows exactly “where he is”). 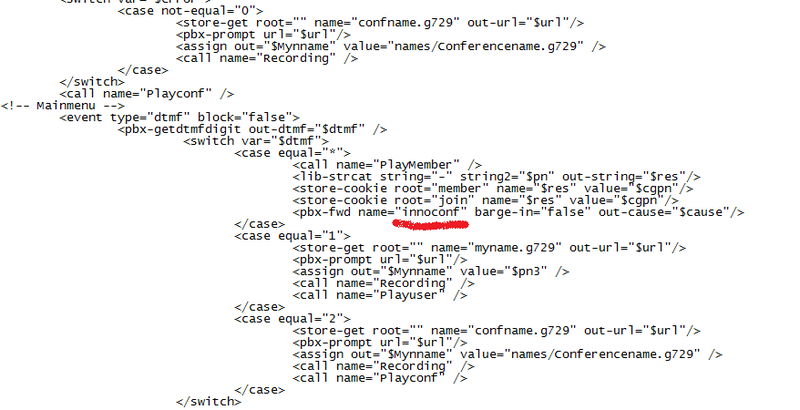 Now put the voicemail object executing the “innoconfB.xml” file in the same group than the BC conference object, but NOT as an active member. Last step: create the second voicemail object. The number of that object is the “innovaphone conferencing” number and the Display Name of this object will be shown to the user calling the innovaphone conferencing. A good example is “conference access” or a similar name. Important: Add the flag “$_pbxfwd=true” to the URL of the voicemail object. 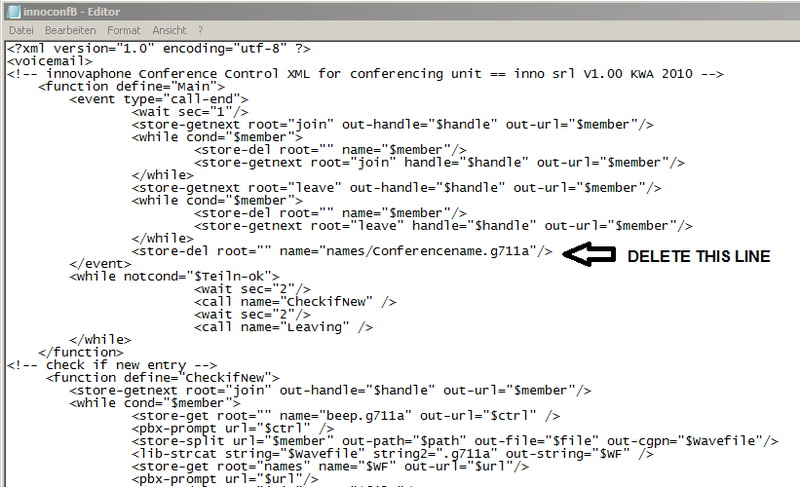 The name of the xml file is “innoconfA.xml” (in the example in the directory “innoConf”). If you delete the indicated line the name of the conference room will not be cleared if the last user exit the conference unit and therefore if the conference is called again, the name of the conference is still there and the user will not here “please label your conference” but go directly to the main menu (where he can still doing that). The innovaphone conferencing is delivered with professional prompts recorded by the voice recording company GM Voices. The prompts are provided in 11 languages. After recording, do the post processing (see relative wiki articles) and convert the file format to 8 kHz, 16 bit mono. Finally, convert the wav files to the .g729 and .g711A format (using the softcod utility or by using the conversion function of the CF card). One hint: When the conference room is labelled, the engine will prompt “to” + “conference room” + the name. No support at the moment for unknown callers (without number - CLIR activated). If in the same time two user access the innovaphone conferencing system and the room is empty - both will hear “You are the first conference member”. However once in the conference, both names will be announced. There is a small delay between the real enter and exit of a user and the announcement (between 0-4 seconds). This is done to avoid too much load for CF card and CPU. On multiple conference rooms on the same system, for each room you have to record your name again. http://download.innovaphone.com/ice/wiki-src#innoconf - download the complete file package of scripts and files described in this article. This page was last modified 16:49, 13 November 2018.